We walked through the beautiful gardens to enjoy a picnic lunch in the sun, overlooking stunning countryside. Finally we played in the adventure playground, making dens and climbing trees … for many this was the highlight of the trip! 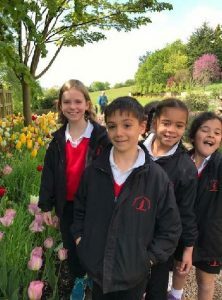 Harry – Year 2 went to Standen House. We went to the conservatory, they had cactuses and flowers. And we went in the bedroom it had lots of William Morris patterns on the wall and on the carpet. They had lots of chimneys. We went in the kitchen and they did not have a tap in the kitchen. When we went into the dining hall it had a fire place, it had lots of blue plates from China. After we had lunch we had a sandwich. Afterwards we went to the adventure playground, we built dens and I got on the climbing frame. 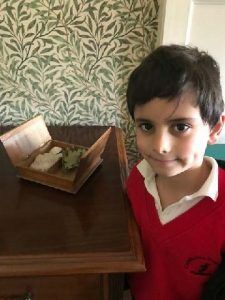 Liam – I visited Standen House with my class. We saw patterns of birds on the walls. We saw sitting rooms and I liked them. William Morris designed them. The house had a lot of chimneys. There were lots of plants in the conservatory. We had a guide who showed us the house. I played in a den in the woods it was fun.